BOSTON, Mass. 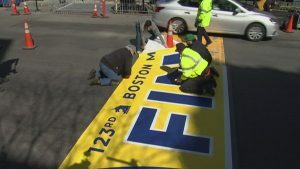 (WTBS) – City officials are making their final security preps for the 123rd Boston Marathon on Monday. In spite of a rainy and cool weather forecast, more than one million people are expected to attend the marathon. Mayor Marty Walsh discussed the safety plan for this year’s marathon. Police, fire and other agencies will be staked out throughout the 26.2-mile route. The Boston Athletic Association announced a few weather-related changes because the forecast calls for cool morning temperatures along with wind and rain. Officials have eliminated the 25-minute gap between waves three and four. This is intended to reduce the number of time runners will have to wait to start the race in Hopkinton. Conditions are expected to be similar to last year.